The following is the Dramatis Personae involved in this human cross stitch. Other than the 1839 sampler, we have no other primary material or personal correspondence to connect the Hillas, Reece, Drew and Knox family together. When Peter Knox wrote that his grandmother’s family went back to the early settler’s he was referring to the following forebears. 1.gt gt gt gt grandfather John Hillas (1769-1837) m. Barbara Dealtry Wakefield Yorkshire 1769. Barbara Hillas died – Windsor Road 1844 aged 78. Both buried St. John Parramatta. 3. gt gt grandmother Annie Reece 1825. Annie Reece married George Drew 1843 and had daughter Elizabeth Jane 1846. Mary Reece who stitched the sampler (1825-1856) was great- aunt of Elizabeth Jane Drew Knox(1846 –1925 the grandmother of Peter, Pam and Titia Knox. Mary Reece was sister to Annie Reece Drew(1821-1900-gt grandmother of Peter, Pam and Titia Knox. These words above were carefully stitched into a sampler in 1839 and have been handed down in the Fearby family through Heather (Bill) Fearby. The fragile sampler is now in the possession of Janet Fearby of Gunnedah, New South Wales, co-author of these Chronicles and the granddaughter of Lilian Knox who married John Thomas Wright Fearby. Lilian Knox Fearby was the eldest sister of Errol Knox. They were both the children of Joseph Knox and Elizabeth Jane (nee Drew). The beautiful stitch work was done in 1839 by a teenager called Mary Reece born in 1825 to David Reece and Hannah Hillas. This is perhaps a strange place to start when tracing the maternal forebears of Elizabeth Jane Drew who married Joseph Knox in 1870. 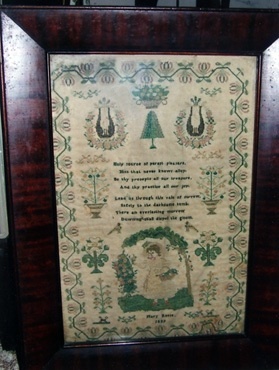 However, the sampler is the only connection we have to Annie Reece whom we assume was given this by her sister Mary Reece, or it may have been given by Mary Reece to her niece Elizabeth Jane Drew. We could easily have started with the arrival of the Hillas family in 1801, or indeed the arrival of the convict David Reece, a rope-maker from Pembroke in Wales who arrived in Sydney 22nd July 1816 on-board the Atlas aged 19, 5’ 6”, complexion fair pale, hair brown, eyes hazel. However, after examining scores of birth, marriage and death certificates it is always the physical evidence that connects us all that is most compelling. It is made more so as we see that Mary Reece was born on 16th August 1825 and baptised on 29th January 1826, and it appears that she died in 1856. When David Reece, supposedly her father, died in that same year, her name was not listed as a daughter on his death certificate. However, her baptism certificate shows David Reece as father and Hannah Reece as mother. Strangely our gt gt gt grandmother Hannah (if that can ever be definitively proven) would only use her married name, McCarthy or McCartney, for her sons. Although even then, sometimes a son turns out to be a daughter (see Isaac and Eliza). It is important to focus on the sampler as circumstantial proof that somewhere there is a familial link that connects Hannah Hillas to those of us living in the 21st century. So herein lies the tale of Hannah Hillas, her husbands and the convict who was father of at least five of her children so that we can continue with our Knox Chronicles that will eventually link us all to the current generation. We are very lucky in that many before us have done considerable amounts of research and work on the Hillas family, which does, in part, give a structure to the complex lives of the early settlers in Australia. Vera Briggs, a Drew descendant who lived in New Zealand, was a pioneer in the Drew research. Mark Pearce, from Kellyville NSW, has very kindly devoted many hours of study on the most minute details, including the interpretation of Church registers and complex documents. He has generously given of his time to share both his findings and knowledge with us. This is truly a team effort to sort out extremely complex lives of the early Australian settlers. Kevin Hilferty from Sydney has, in particular, has also provided his valuable time and contributed a great wealth of historical knowledge, background and expertise, through a keen historical perspective of life in early and mid 19th century New South Wales. It would no doubt amaze our ancestors today if they knew how much we admire and respect their great spirit of survival. John and Barbara Hillas gt gt gt gt grandparents to the children of Titia, Peter and Pam Knox and the Fearby family. The following research was contributed and written by Kevin Hilferty and Mark Pearce (see Glossary). John Hillas was born in Wakefield in Yorkshire, circa 1769, and it was there he married Barbara Dealtry on 18th March 1789. She seems to have been three or four years older than her husband. It is possible that Barbara may have been descended from the Huguenots but that has not been proven. They had three children born in Yorkshire, Mark (circa 1790), Hannah (1795/1796) and John (circa 1797). In 1800 they were selected to join a group of artisans and farmers to go to New South Wales, where their skills were needed by the new colony. The settlers and their families traveled on three convict transports, the Nile, Canada and Minorca, which sailed from Portsmouth via Rio de Janeiro and arrived in Sydney on 12th December 1801. The Minorca (407 tons) carried as passengers seven men, eleven women and 20 children plus 99 male convicts. The Canada (403 tons) carried as passengers six men, twelve women and eleven children plus 101 male convicts. As a farmer, Hillas was granted land at Toongabbie where he established Hillas Farm. If he and the other new settlers improved their land, built sturdy homes and outbuildings and increased their wheat harvest, they were granted cattle or sheep from the Government herds. John Hillas is recorded as receiving such cattle. He and Barbara had three more children in the colony. Ann was born circa 1804 at Parramatta as were her brothers George, born circa 1806 and James, born circa 1807. On 31st March 1802 John received a grant of land in “western” Sydney’s present day Kellyville, which he called Hillas Farm. This was followed by a further grant of 160 acres on 11th August 1804 in the same area, this land being called Stanhope Farm. A number of advertisements appear in the Sydney Gazette during these years advertising John Hillas’ Stanhope Arms Inn, which was one of the earliest refreshment houses established on the road between Parramatta and Windsor. In 1806 a new Governor, William Bligh arrived in the colony. (This was the famous Captain Bligh of the Bounty). Bligh came with orders from London to stamp out trafficking in spirits, a profitable racket involving officers of the garrison regiment, the New South Wales Corps. This led to tension between the Governor and the officers, led by Captain John Macarthur. On January 26, 1808 the officers arrested Bligh and put him on a ship bound for England. On 6th May 6 1808 five "loyal settlers" from the Baulkham Hills district (which then included Toongabbie) sent a letter to the Lieutenant Governor, Colonel William Patterson, supporting Bligh "to whom we are most zealously attached" and urging that he be permitted to return. The officers took their revenge. They ordered the settlers to report all their property at a general muster. When the settlers did not comply, the officers sentenced them to a month¹s imprisonment. Not daunted by this harsh treatment, on November 11, 1808 John Hillas and 25 other free settlers and farmers from Toongabbie signed a letter to Viscount Castlereagh, Secretary of State for War and the Colonies, reporting on the sad situation in the colony since the removal of Bligh. They added: "Several hundred more signatures could have been obtained but the system of terror which reigns in the colony prevented us from venturing further." Hillas and eight other free settlers from the Baulkham Hills district sent a further letter to Castlereagh complaining about conditions in the colony on 22nd February 22 1809. Governor Bligh confined to a ship in Hobart awaiting passage to England also wrote to Castlereagh complaining about the officers' treatment of Hillas and the other free settlers. Hillas is mentioned in the historical records in a letter to Bligh's successor, Governor Macquarie, from Lord Liverpool, Secretary of State for War and the Colonies (and subsequently Prime Minister) dated at Downing Street, London on 10th March 1809. Liverpool refers to an application made to him on behalf of Hillas and adds: "I am induced to desire that if you find him to be a Person deserving the Encouragement of Government and likely to be benefitted by it, you will allocate to him a Proportion of cattle and offer him such Assistance you may think is reasonable." Generation 1 John Hillas b. Wakefield Yorkshire 1769-1837. Buried 22nd March 1837 St. John, Parramatta. Married Barbara Dealtry (b.1765- 9th May 1844) (533 vol: 29) Parish of St. John – 78 years old. Barbara Dealtry b. c 1765 in Yorkshire may have been from a Huguenot family. Further research is being made on her family. Generation 2 Children of John Hillas and Barbara Dealtry Mark b. Yorkshire 1790-1872. John b. Yorkshire 1796-1847. Married Martha Pearce 1826 – V182652 10/1826 & V18263897 3B/1826. Ann b. 1804-1841 married James Magauran on 2nd June 1823 - see separately George b. 1805-1875. Married Elizabeth Bourgin. The lives of the Hillas sons have been well documented but it is the lives of the daughters that appear so interesting and certainly more relevant to the descendants of David and Annie Reece and the Knox Family. Again we thank Mark Pearce for putting together as much information as we may ever be able to find out. The reason that Ann Hillas has been somewhat of an enigma is that at first glance it would appear that our gt gt grandmother Ann Reece was born to Ann Hillas and not Hannah. It clearly states “Ann” on the birth certificate but Hannah’s name was interchangeable with Ann. As Mark Pearce points out it would be unlikely Hannah would have remained in a stable relationship with David if he were having children by her sister as well. The following is Mark Pearce’s research written 19th January 2005. Known facts about Ann Hillas: The “2nd eldest daughter” of John & Barbara Hillas. 1822 General Muster - Ann Hillas, born in the Colony, servant to J. Palmer at Parramatta. 5th May 1823 Sought permission to marry (Colonial Secretary’s Index). Married 2nd June 1823 JAMES MAGAURAN at St. John’s Parramatta. 17th July 1824 fined for selling liquor without a license. Appears as McGourin. (Bench of Magistrates, Parramatta/Colonial Secretary’s Index). 1823,4,5 General Muster – Family group listed as – McGOURAN, James, Parramatta (Convict, Surrey 1816, Life). (Government Servant to Ann Ellis or McGouran) McGOURIN, Ann, Born Colony (Wife of James McGouran). McGOURIN, Francis, 2 Born Colony. Married 1st August 1834 WILLIAM GREEN at St. John’s Parramatta (marriage entry shows her surname as McGOVERIN but she signed it as MAGAURAN). Her age was then said to be 27. Died 10th August 1841 aged 36 or 37 years. Buried 12th August 1841 and buried at St. John’s Parramatta. She was born between 1804-1807 (from ages given at 1828 census, at 2nd marriage and at her death), however she was born by Marsden’s 1806 Female Muster, therefore possible birth dates are 1804 or 1805 or maybe early 1806. (Mark Pearce January 1,9 2005). Anne Hillas/Magauran/Green is buried with her parents in St. John’s Cemetery, Parramatta – the inscription reads: also Anne Green his second eldest daughter who died August A.D. 1841 Aged 37 years (see headstone 3.I.9 St. John’s Parramatta). There have been no easy answers connecting Hannah Hillas to her daughter and our gt gt grandmother Annie Reece. One of the difficulties is perhaps because there seems strong evidence that she may not have been able to read or write and much of the documentation was written phonetically. This is what we do know from musters, birth marriage and death certificates and the 1828 Census and why Ann, Hannah, Anna can become confused. 1811 Hannah marries John McArthur (1305 Vol: 3A) on 23rd December 1811 at St. Matthew’s Church Windsor. According to Mark Pearce who examined the register – both bride and groom signed the register with an “X” probably indicating that neither of them could write their names. 1814 General Muster there is an entry HANNAH McCARTY Came Free on the Nile (Wife to T. McCarty). 1815 - Hannah and John McCarthy have daughter Susanna – however, we have no further documented evidence except per Vera Briggs research. There is a Susannah Reece aged 13 years living as a Lodger in the home of William T. Bayliss in Cornwallis. According to the census he was 34 years old married to Louisa Bayliss with one child. Presumably Susannah was sent to work in household even though she is listed as “lodger”. There is certainly no further supporting evidence that this Susannah is the daughter of our Hannah and John McCarthy. It is not clear at what point Hannah and John McCarthy parted ways. There is evidence that a John McArthur passed away and was buried on 14th December 1819 - V18194469 2B/1819 burial at St. P. Sydney E aged 36 years, but there is another John McArthur - V18173919 2B1817 aged 33 in 1817. This John McCarthy lived at Portland Head – he was buried on 27th December 1817 – ceremony performed at Wilberforce. However, there is no doubt that Hannah met David Reece who played an enormous role in her life. Mark Pearce’s Summary of Hannah’s Life: Known facts - Born Yorkshire, England approximately 1796. Came to Australia with her parents (John & Barbara) and 2 brothers (Mark & John) on board the “Nile” which arrived in Sydney on 14th December 1801. Married 23rd December 1811 to JOHN McARTHUR at St. Matthew’s Windsor. Neither bride nor groom were able to write. 1818 a child, Elizabeth, by DAVID REECE is baptised (V18184830 1B/1818 and V18181154 148/1818). 1822 General Muster – Listed as HANNAH McCARTHY - came free on the Nile (no further details given). 22 May 1823 had a child, Isaac, by DAVID REECE. This child was baptised at St. John’s Parramatta on 3rd August 1823. His mother’s name is given as HANNAH MCARTHUR. (We have subsequent information to believe that Isaac should have read "Eliza" and it is probably that Isaac never existed). 1828 a child, George D., by DAVID REESE is baptised (V182868 12/1828) Mother’s name given as Hannah McCarty. On 17th November 1832 Hannah Hillas (widow) married WILLIAM BRINKLEY at St. James’ Sydney. Her alternate names of ANN ELLIS and HANNAH HILLIS and HANNAH HILLAS are listed. Hannah Hillas, Ellis, Brinkley, Reece died on 9th July 1838 aged 43 years. We are certain that David Reece and Hannah were not married. At Isaac’s baptism he is listed with the surname of McArthur. This was only ever done where the children brought for baptism were born outside of a marriage relationship. We have been unable to find a record of the birth of Susannah in about 1815. She is listed in the 1828 Census under the surname REECE (see above). So it seems likely that she was an infant when her mother began a relationship with David Reece, and she was given his surname. Our records also show that Susannah married a JOHN WALTON in 1839 but we can find no record of this marriage in the NSW Indexes– above details provided by Mark Pearce NSW. It has become very likely that the name Susannah Reece may have been a red herring and that the only connection is the surname. No doubt Vera Briggs recorded her name based on circumstantial evidence. David Reece appears to have been a rope maker from Pembroke in Wales. Whatever his transgression he was shipped over in the “Atlas 3” Sydney 22nd July 1816 aged 19, 5’ 6”, complexion fair pale, hair brown, eyes hazel - it appears he had a 7 year sentence. It is not clear when he got his ticket of leave. According to Kevin Hilferty “a convict's ticket of leave was usually granted by the colonial governor four years into the standard seven year prison term. There were exceptions, of course, but this was the general rule. This meant that the convict was free to go into the normal workforce (although he or she could not return to Britain until pardoned - a rare event). The system saved the colony from the cost of the convict's upkeep. Marriage or a stable relationship would have been a factor, which a governor would have taken into account when considering granting a ticket of leave. This would indicate that David Rees by 1828 had already become a Farmer and Grazier as indicated at the birth of his daughter Jane in 1830. Here we find no trace of Isaac but we see Eliza for whom we have no birth certificate also born in 1823. Elizabeth: 1818- a child, Elizabeth, by DAVID REECE is baptised (V18184830 1B/1818 and V18181154 148/1818) Elizabeth Reece born November 18 1818 and baptized 27th June 1819 (4830 Vol: 1B – Registered Parramatta B In 1828 aged 10 she is living with her aunt, Ann Magauran, who is married to James Magauran. Elizabeth Rees or Reece (spinster) married George Watson (bachelor) in the Parish of St. James on 12th November 1839 by license. George N. Wood was the officiating Minister and David Hill of Pitt Street and Eliza Reece of Parramatta Road were witnesses (126 Vol.23B). George Watson dies either in 1844 (V1844443 29/1844 age 35 or V1849871 340/1849 age 41. Elizabeth marries George Spears in 1850. In 1856 it is George Spears who is witness at David Reece’s death certificate. Isaac 1823 – 22nd May had a child, Isaac, by DAVID REECE. This child was baptised at St. John’s Parramatta on 3rd Aug 1823. His mother’s name is given as HANNAH MCARTHUR and he is baptised Isaac McArthur. (This we believe should have been Eliza Reece). There is no further mention of Isaac – there is an Isaac Reece (widower) marrying Ceary Sims (widow) in 1840. However, it is unlikely he would be a widower by 16. We have been unable to find anything further on this and as of this date Isaac remains somewhat of a mystery. More mysterious still is that another child, Eliza, who seems to have been born in 1823 and there is no indication that they could have been twins. Eliza Circa 1823 We have never found a birth certificate for Eliza but she definitely exists as Eliza or Elisa Reece. She first appears in the 1823 General Muster as indicated below born 1823 and in the 1828 Census as aged 5. In 1840 there is an Eliza Reece of Parramatta Road who is a witness at Elizabeth Reece’s marriage to George Watson. There is an Eliza Reace of the Parish of Petersham (829 Vol: 24B) who marries Richard Guise Junior from the Parish of Hume. They were married in the Parish of Petersham in the County of Cumberland on 6th April 1840. There is an Elizabeth Guise of Philip Street aged 27 years who dies on 11 March 1852 in the Parish of Camperdown. There is no indication of the parent’s names on the New South Wales Births, Deaths and Marriages Register. Initially this would appear a likely candidate to be our Eliza Reece. The only question mark is “Eliza” shown as living in 1856 on David Reece’s death certificate. Elizabeth’s second husband George Spears witnessed the certificate. Since Eliza had been a witness at the wedding in 1839 one might suppose that she would know if her sister had passed away and would not be shown as “living” if in fact she had died four years earlier. In addition the Eliza shown as “children of David Reece” is aged 35 in August 1856 – which would indicate a DOB of 1821. Conclusion: no record of Eliza Reece being born and no record of what happened to Isaac Reece or Isaac McCarthy. It may be safe to assume that Isaac was in fact Eliza but we have to be careful, since no other dates coincide as shown by data available. 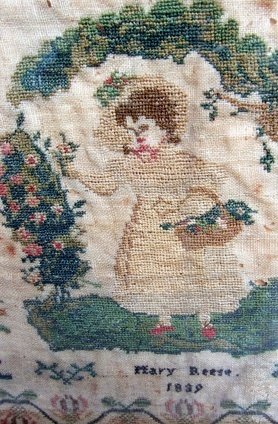 Mary (who stitched the sampler) 1825 16th Aug 1825 Hannah Hillas apparently had another child, Mary, by DAVID REECE. This child was baptised at St. John’s Parramatta on 29th January 1826. 4 Vol: 10. David Reece is listed as Farmer, living at Seven Hills. Hannah is listed as Hannah Reece on Baptism Certificate 7339 Vol: 1c it is “not stated”. There is a Mary Reese of the Parish of Murrumbidgee who married John Gordon of the Parish of Tarcuttah Murrumbidgee on 13th February 1847 at Gunendro Murrumbidgee by license. However, there is no conclusive evidence that this is the same Mary Reece. Most likely Mary Reece never married as we have found: Mary Reece – abode Infirmary age 21 years who died on1st February 1856 in the Parish of Camperdown in the County of Cumberland. It is most likely that the 21 should read 31. This would make sense that Mary moved close to her sister Eliza Guise and died very young. Whether she had already given her sampler to her sister Annie, or it somehow got passed down is not clear. As indicated above, we can only make an assumption about the reason for her being in Camperdown, as 1856 was the year that David Reece died and according to the records at hand, her sister Eliza. Jane 1830 – 3 November and baptised 21st November 1830 - Father David Reece and mother Hannah Reece (V183010148 1C/1830). Jane Reece died 10 years later. Hannah Brinkley (nee Hillas) Hannah was buried in the Old Sydney Burial Ground with her daughter Jane in July 1838 at the very young age of 43. David and Hannah Why Hannah left David Reece aged 37 for the 31-year-old Calico Printer William Brinkley marrying him on November 17th 1832 is not clear. She claims to have been a widow, although she was technically married to David Reece, although there never appears to be a certificate. Hannah or Ann Ellis/Hannah Hillis/Hannah Hillas, was also 37 at the time of this 2nd/3rd marriage. When she died 6 years later in 1838, William Brinkley is listed as a Publican. She was buried where she married in the Parish of St. James Sydney, County of Cumberland. The building of Central Station and her headstone was moved to Bunnerong years later. She is listed along with other family members in the book “Gravestone Inscription”, New, Vol 1, Sydney Burial Ground by Johnson and Sainty (Sydney 1973). As much as the mystery behind Hannah marrying William Brinkley is what happened to David Reece. We do know that in 1833 the Australian newspaper records that David Rees of George County assigned all his cattle to the children of Hannah McCarthy. The story of David Reece – to be continued as part of the Knox Chronicles It is possible that David Reece went to live with his daughter Elizabeth Reece and her second husband George Spears in Surrey Hills. On 30th November 1854 we see that David Reece purchases the “Horncastle” filly three years old belonging to a Richard Trowle. This order was placed through a Mr. James Howlett Wolgrove. Much more research has to be done on David Reece – how he assimilated so quickly from being a 19 year old convict in July 1816 to a cattle owner is unclear. It is possible that he was fortunate to have been working for the Hillas family. Whether he was actually the father of all of Hannah’s children is also unclear. Isaac and Mary’s name are not found on his death certificate and Anne is given a wrong age. Why Hannah and David would call their first born Elizabeth and second born Eliza is as mysterious as why the Hillas parents would call their eldest daughter Hannah and second daughter Anne – as the names are interchangeable leading to confusion. Documentation certainly points to our forebears being David Reece and Hannah Hillas. The fact that it is only on Anne Reece’s birth certificate that her mother is called Anne is most likely a clerical or phonetic error. The only other question remaining is why would little Annie Reece aged seven not be living with her parents and siblings but with her grandparents in the 1828 Census. This can be answered that children, especially the girls were sent away at very young ages (see 1828 Census), children were listed as lodgers as young as seven as in the case of our Annie Reece. It is only by skipping a generation that the name Hillas appears again, with the birth of Leslie Haldane Hillas Knox (Errol Knox's brother). Here we see we see Annie Reece’s grandson being given his great great grandfather’s name. There is certainly much more to add here. Isaac Reece remains a mystery – as it is unlikely the Isaac Reece who married aged 16, as a widower is the same Isaac born in 1823. Eliza remains a mystery, as there does not seem a birth certificate for her. No doubt these mysteries will be resolved but the only conclusion that can be drawn is that Isaac is really Eliza and since it appears that neither David Reece nor Hannah Hillas could write there could have been a misunderstanding at the font. This is not a very satisfactory explanation. We will now move on to the next generation and hope that the many questions still unresolved will find answers. The next generation is much easier as again Carol Baxter and others have already done much work. We start again with Mary Reece – who was born in 1825 but beyond that all we know is that she stitched a sampler still in the possession of the descendants of David Reece and Hannah Hillas, namely the co-author of these Chronicles, Janet Fearby. This is the link that survived the Hillas/Reece/Drew/Knox and onto to the present day Fearby/Knox connection. Mary Reece’s older sister Annie Reece born on 16th January 1821 married George Drew on 9th January 1843. The marriage took place in the Parish of Hunter’s Hill in the County of Cumberland. George Drew is listed as being of the Parish of Baulkham Hills (Bachelor) as is Ann Reece. The witnesses were listed as Standish Drew (brother) of Baulkham Hills and Charlotte Drew of Parramatta. The next segment of the Knox Chronicles continue with the story of George Drew who married Annie Reece – gt gt grandmother to Janet and Tom Fearby and Jane Knox and all the descendant of Joseph Knox.